Two months before important elections in Iran, former President Hashemi Rafsanjani has launched another challenge for power. 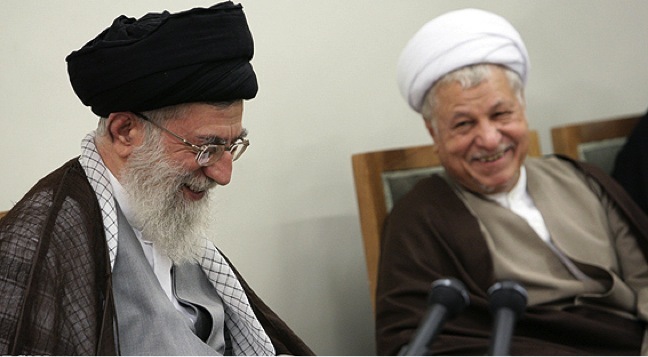 Rafsanjani, bitterly opposed by hardliners and under pressure for several years, used a newspaper to rattle the foundations of the Islamic Republic. He repeated his suggestion that the Supreme Leadership could pass to a council once the current Leader, Ayatollah Khamenei, died, and he asserted that the Assembly of Experts — the body which names and can nominally replace the Leader — can supervise institutions that fall under Khamenei’s authority. Rafsanjani also signaled moves for a bloc of candidates for the Parliamentary and Assembly elections in February, challenging hardliners and conservatives. He welcomed the announcement by Hassan Khomeini, the grandson of the Islamic Republic’s founder Ayatollah Khamenei, of an entry into politics with candidate for a seat in the Assembly. Some in the parliament use the platform to propagate extremism. Some of the country’s institutions help them, more or less. Islamic Republic of Iran Broadcasting also broadcasts them, which encourages them….The extremists in Iran make statements and most [threats] are not acted upon. The former President has long suggested changes in the Iranian system to redistribute power. In summer 2009, he was effectively ostracized by other elements of the regime after a Tehran Friday Prayer in which he supported the right to protest, amid mass demonstrations followed disputed Presidential elections. He was stripped of the prayer leader’s role, and he lost his chairmanship of the Assembly of Experts in 2011. Two years later, he was blocked by the Guardian Council from running for President. However, Rafsanjani has had a political resurrection after the surprise victory of his ally Hassan Rouhani in the subsequent election. He has used the space to defy pressure on his family, even challenging the Supreme Leader. Earlier this month, he confirmed that he will stand for chairmanship of the Assembly in February. The main duty of the assembly is to determine the Supreme Leader, which they did. They also supervise the Supreme Leader, which is carried out by the investigation commission. They supervise and review institutions that fall under the Supreme Leadership and report to the Supreme Leader. The assembly should not be negligent of institutions that fall under the Supreme Leadership. We must, at least, pursue and review institutions that fall under the supreme leadership so their problems can be addressed. In the constitution, there is no such supervision over the Supreme Leader.